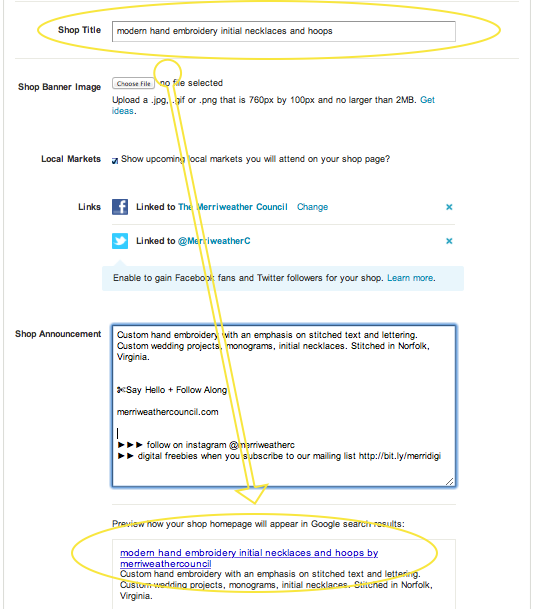 After seeing many confused sellers in the forums around the time I was checking in on that post regarding the slow sales, I decided to put a post together about SEO for your Etsy shop but, then I got this fancy pants software to record my screen, and so I thought it would be fun to do it that way – and I think it will be easier for you to follow. Sorry this caused a delay, but it’s for the better. Even if you think you know the basics, take a look anyway, you never know. This is how I’ve always dealt with SEO and this is in line with Etsy’s guidelines. Keep in mind, search results change for a variety of reasons. And SEO is only part of the equation. Sometimes I see a listing of mine on the first page of search results, sometimes it’s a few pages back. 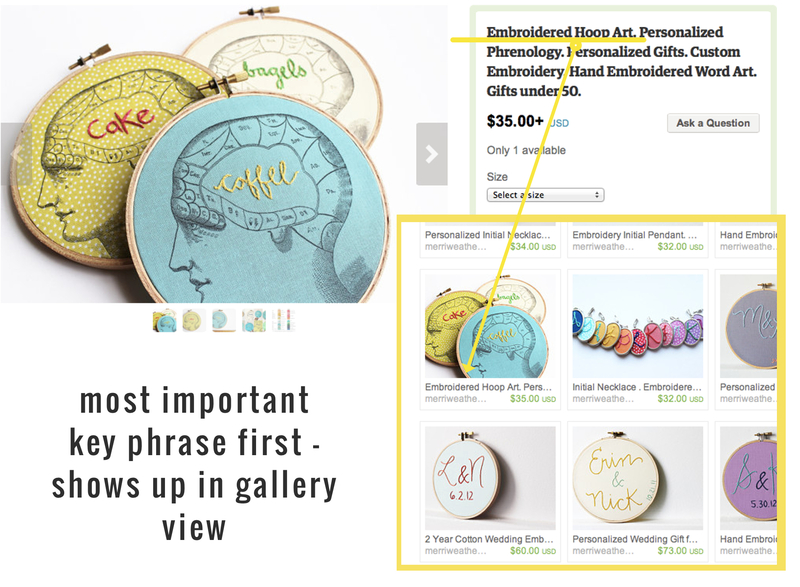 It depends on many things but this will give you the best possible shot at having an optimized shop for Etsy’s search system. Again, this is the basics. Side note, does everyone hate the sound of their recorded voice? Yeah, right? etsy lessons etsy SEO from Danielle Spurge on Vimeo. I’m happy to follow up and answer any questions you may have regarding the content of the video. Please keep in mind that this is a basic overview ( Read: basic Etsy SEO ). Lots to expound upon here, that can be covered in another post. The search bar on Etsy. My shop stats – looking back at keyword referrers for longer periods of time, way back in the last bunch of pages of results rather than the first few. Etsy doesn’t use descriptions for SEO, but Google does. Write natural sounding descriptions and just keep your keywords in mind when writing. This tends to be pretty natural as you describe the item, so you probably are already doing it. But again, Etsy DOES NOT read your product description for search results. There is more you can do to optimize your Etsy shop. There are lots of resources to help you. Here is some info directly from Etsy. Like I said, SEO is just a part of the overall health of your shop, back links, social proof, custom service and branding are important as well. Please leave any questions in the comments for me, I will answer them if I can! Do you know if renewing your listings helps with SEO? Thank you so much for taking the time to make this video. I’ll be going through all my listings now and am so happy to have this as a springboard. SUPER helpful! The way that etsy’s search results are brought up is through relevancy and recency plays into that so, yes, to a certain extend i think it can be helpful to renew. I like to renew after making changes to the title or tags to sort of “set” it. I find that renewing can help. Thank you SEO guru. :) I never seem to get views through the search, so this is so helpful. *this! Sorry to leave two comments. I couldn’t let that typo slide. great! i’m glad it was helpful. Thanks for letting me know! Hey Danielle! Thank you for providing the most straightforward and easy to follow SEO tutorial I’ve seen! I have a question though that I haven’t ever found an answer to- does the order of the tags matter? Thanks! Hi Danielle, excellent advice here. I have a quick question about changing titles. I was able to get one painting featured in the Better Homes & Gardens blog and the link from that feature brought in a lot of traffic last year. But, now, I’m editing title names and am afraid that changing the title of that listing will take away the link to the magazine’s site (since the item name becomes part of the URL). What do you think about changing titles after a relevant media mention is linked to one? I took off everything after the “…7/” and it worked, which I knew it would. Then I put in any random word after the “…7/” and it still worked so my guess is that you can change the title without losing the traffic. After your comment, I tested this out with a new floral painting (which I had linked to on my blog.) I changed the titles around dramatically, but did not change the item number. And, yes, it still works. Thank you so much for the lesson on titles and tags. I’ve never really known what was the best way to list an item so I am going to do some tweaking of my titles and tags as you have suggested. I just passed the 100 sales mark and thought my sales were on the upswing, but the last few months have been really bad. Hopefully, the changes I make will help. Thanks, again, for the video. My sales almost doubled last year after tweaking my titles and tags as you outlined in your article. Thanks!! The tweaking seemed to take forever, but I am glad I did it and I felt really good about my shop. I also joined several teams and post regularly to the discussions. But… sales were great till December of 2015 and continue to be really slow in 2016. Did something change on Etsy? That’s awesome!! Things naturally tend to slump off a bit after christmas. There haven’t been any changes to the system that they told us about anyway since the fall. :) I wouldn’t worry, very natural. Thank you for such great info! I’m curious if you have another post explaining back link, social proof, and custom service? Would love to know more! Hi Danielle! I revamped all my titles and keywords immediately after watching the video a couple of months ago, and for a few weeks had great views (well, great for me, which was more than 10 each day), but then the views fell off, and I’m not sure why. Wonderful tips – thank you so much for taking the time to share these with us!